I'm sure somebody out there is excited about this, but it's not me. Director Robert Rodriguez revisits the land of the ridiculous in MACHETE KILLS, the sequel to the 2010 film, Machete. Although I wasn't a fan of the original film, which follows the title character (appropriately played by Danny Trejo) on a fool revenge mission, I did enjoy Michelle Rodriguez's small but vital role as the badass revolutionary princess. Judging by the new teaser trailer, it looks like she will be the diamond in the rough in the new film as well, which has Sofía Vergara terrorizing the antihero with bosom bullets and Charlie Sheen reclaiming his Latin roots as U.S. President Carlos Estevez. Oh, and Mel Gibson and Lady Gaga. I love Rodriguez's films, for the most part. But I really want to know how his lackluster films like Machete and Spy Kids got sequels while we still wait for the follow-up to Sin City (which is reportedly heading to theaters October 4th). Or Grindhouse: Planet Terror? The film also stars Alexa Vega (Spy Kids), Vanessa Hudgens, Jessica Alba, Cuba Gooding Jr, Demián Bichir and Amber Heard. 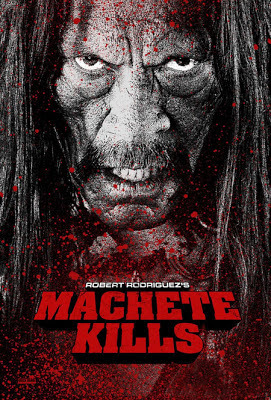 MACHETE KILLS heads to theaters September 13th. These movies are really for a certain demographic and I'm part of it. It's all just insanely over the top and silly. On the bright side for you, Sin City 2 is in production last I heard, so hopefully it's coming down the pipeline soon. Mel Gibson AND "Carlos Estevez"?! I'm all over this.